The Alamo is an Air-to-Air missile which targets just about anything that flies, including helicopters, drones and even other missiles! 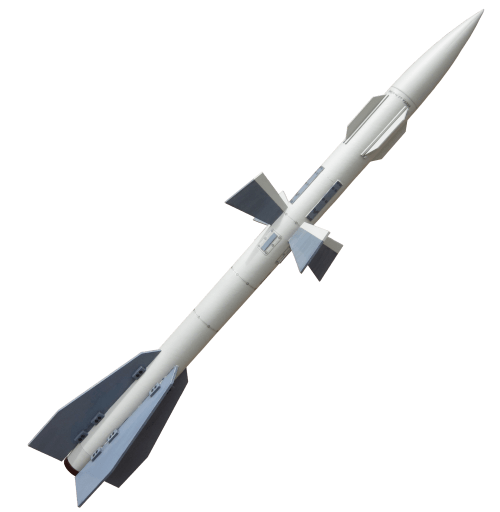 NATO has given this AAM missile the name AA-10 Alamo, it is also known as the Vympel R-27. This highly-detailed Alamo military scale kit is excellent for small launch sites. It is a large and heavy model rocket. Ignite those slow launches that everyone can enjoy! Three (3) sets of fins and a boat tail give this scale model rocket kit lots of personality. Pick up this scale model of this medium-range missile today for some serious modeling fun. The AA-10 Alamo comes compete with laser-cut centering rings, fins, Decals, Ejection Baffle, plastic Nose Cone and Tailcone and 15" Plastic Parachute Kit.